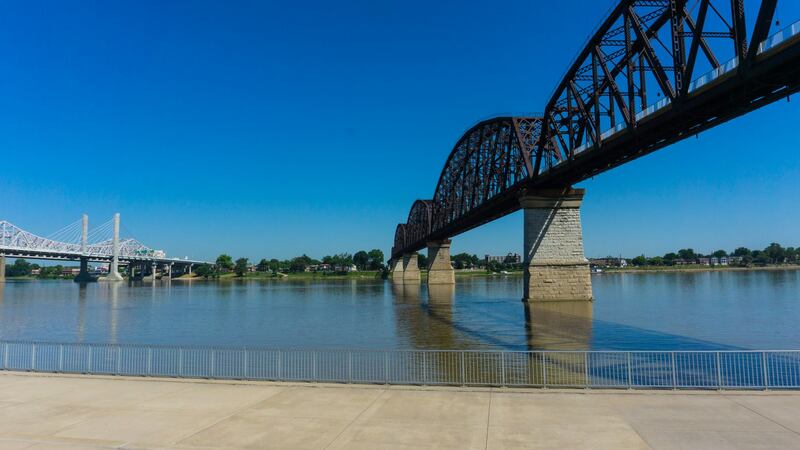 Waterfront Park is an 85-acre municipal park draping the northern portion of Louisville along the Ohio River. The park first opened in 1998, and has expanded over the years with future phases up and coming. The land making up Waterfront Park was used for industrial purposes prior to its construction, but also holds a rich history dating back to Louisville's early days in the late 1770s. Over 1.5 million visitors explore the park annually. Waterfront Park is home to two major pieces of the puzzle: the Great Lawn and the Big Four Bridge. The former is used for a handful of festivals and concerts throughout the year, and is a perfect place to catch a few rays or watch the barges and steamboats traverse the Ohio. The latter began life as a railroad bridge, which fell into disuse between 1969 and its transformation into a pedestrian bridge between 2009 and 2014. If you're wanting to give your data plan a break, Waterfront Park has free Wi-Fi, the largest park in the U.S. to offer such service. Linear fountains, docks for boats, and a long mixed-use trail encircling the city are also at Waterfront Park. Waterfront Park is home to several large gatherings and events throughout the year. The month of April occupies the Great Lawn and the Big Four with all things Derby, beginning with Thunder Over Louisville, the largest annual fireworks display in North America. Over 600,000 attend Thunder annually, taking in the afternoon airshow and evening celebration of fire and thunder. Following Thunder on the last days prior to the Kentucky Derby is the Kentucky Derby Festival's Fest-a-Ville. Concerts, the Chow Wagon, rides, and several events fill the days leading up to the biggest show in horse racing with joyous celebration. On the last Wednesday of every month from April to September, local radio station WFPK-FM hosts its Waterfront Wednesday concert series on the Great Lawn. The free concerts feature a mix of blues, jazz, rock, folk and more, and are a great way to get over the hump near the end of the month. In mid-July, the Great Lawn comes to life with the annual Forecastle Festival, which has called Waterfront Park its home since moving from nearby Riverfront Plaza/Belvedere in 2010. The three-day music festival welcomes over 75,000 attendees from all over the United States and beyond, showcasing a wide range of bands and genres every day. Forecastle is also an art and activism affair, with an emphasis on sustainability. In April of 2017 the city annouced that Phase 4 of the park would begin to take shape, starting with a 4.5 acres that will be used for an MSD project. Phase 4 encompasses 22 additional acres and will help connect 7500 people who live within a 15 minute walk in the Portland neighborhood with recreational and entertainment options. Phase 4 will be divided into multiple sections with names such as Container Park, Confluence Plaza, Exerscape and Foundry Gardens. As we learn more about the design, we will update this post.